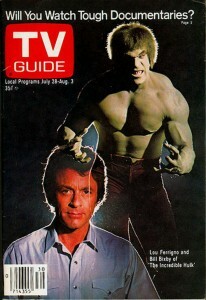 The Incredible Hulk TV series was a big part of my formative years. 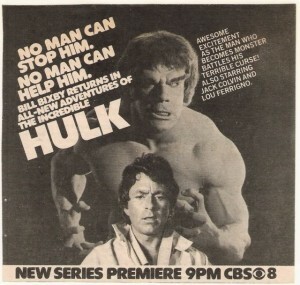 Growing up, The Incredible Hulk was one of those shows watched often by my entire family. I have memories of my family sitting in our dimly lit living room while snow fell outside. 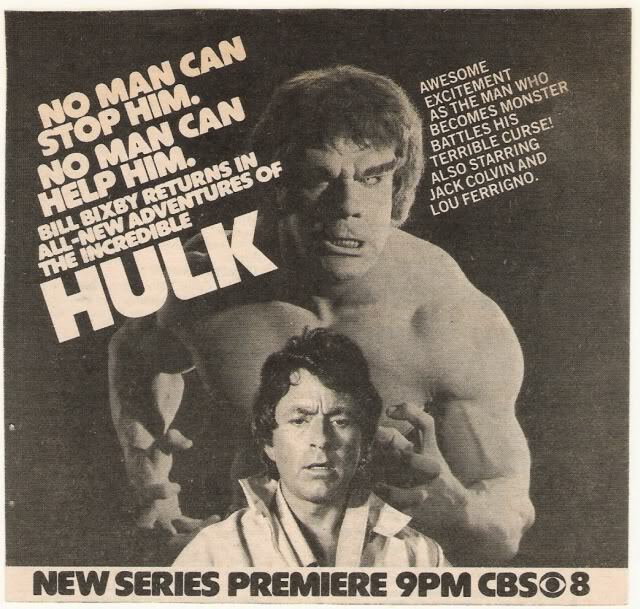 I also remember finding out my older cousin only watched the show until the Hulk showed up and then he'd “step out of the room,” giving me a feeling of pride because Hulk didn't scare me. Why would he? He was a monster, but he was not monstrous! The show also caused some confusion when I read Hulk comics later and Hulk was talking. Obviously, the comics were doing something wrong! To this day, a talking intelligent Hulk just doesn't feel right to me. The show is classic 70s/80s formula. In fact, sometimes the formula is called “the Hulk formula.” It comes from The Fugitive, from the 60s, but it was a well used formula in 80s primetime television. Man is on the run (like The Fugitive, or The A-Team, or even the Planet of the Apes TV show) (or at least he's MOBILE, like Knight Rider or Quantum Leap); man comes into town not looking for trouble; trouble finds him; man helps out some people; man leaves, still on the run, heading out to where ever the road will take him…and we all know, the road is taking him to next week's episode. Add to the classic formula the twist on the formula: not only is he on the run for a murder he didn't commit, he is also trying to find the cure to what plagues him: when he gets angry, he turns into the Hulk! So the show is worth watching, but it's also four and a half seasons long. (Season five is a shorter one.) So there are a LOT of episodes. Eighty-two, to be precise (this article is not about the TV movies). And let's face it, in addition to the repetition, many of the episodes are 80s primetime action/adventure. And that means they can be, well, bad. The series is on Netflix, though, meaning very easy access to them. RULE OF THUMB — A quick and easy way to find the best episodes? Watch the two-parters. There is only one two-parter that I would not recommend, and that's the second TV pilot movie they made, called The Return of the Incredible Hulk as a TV movie and A Death in the Family for it's two part syndication. A Death in the Family isn't BAD. It's just not great. At all. Although it DOES have a couple unintentionally laughable moments. And I laughed. Hard. But if you just want a good taste of the best of the show, watch the two part episodes. THE BEST, in viewing order — These are the episodes that, if you want to see some pretty good television from the late 70s/early 80s and are a Marvel fan, you should check out! The Incredible Hulk (pilot, season 1, ep. 1) — A fairly tight script that sets up everything. It may start a bit slow, but the thing about this show is that it is more about character and drama and less about super heroics. It has to be, since there is no real physical match against the Hulk. Like Superman, Hulk is unbeatable, so the drama must come from the human elements. Married (season 2, ep 1) — As Banner seeks a cure, he finds love. And yes, the title is not misleading! But just a passing knowledge of how TV worked back then spoils the details of this episode, but the journey is worth it. It's emotional and well acted, one of the best of the series. His love interest was nominated for an Emmy based on this episode. As the season 2 opener, it flashes back to season one and Banner's origin story. So a bit repetitive if watched back to back with the pilot, but it works as a sequel to the pilot. Mystery Man (season 2, eps. 15 and 16) — The reporter on Banner's trail, Jack McGee, gets closer to his quarry! The Psychic (season 3, ep. 18) — This episode features a woman with a super power — she can see into the future ala Stephen King's Dead Zone. She's a psychic. Surprised? The psychic and the Hulk make for a good team, and if we weren't locked into such an episodic format, she could have been a great recurring character. A strong episode with great acting and some interesting, if predictable, moments. (It even features a Superman-esque “throw the gun at the superhero when you're out of bullets.) But the highlights are Bixby's chemistry with Brenda Benet, the psychic, who was married to Bixby at the time. Prometheus (season 4, eps 1 and 2) — This is the best of the best, beating out the pilot as the best of the series. It has new things happening with the transformation, it has action and I can't help wondering how much of the entire season's budget went into this one episode! The military opponent in this episode is a match for Banner/Hulk. It's good. Very good. The First (season 4, eps. 12 and 13) — And THIS episode is almost as good. Almost. There are weak points to it, but as Banner goes to investigate rumors of a creature similar to his own alter-ego, we realize that this could see Hulk going up against another beast! And it happens! This episode explores the mythology some, brings Banner closer to a cure (yeah, right), and actually features an evil Hulk (played by Dirk Durock — The Swamp Thing!). THE WORST — These are episodes that you'll watch if you are a completionist. But they are also, in all honesty, not good. At all. Never Give a Trucker An Even Break (season 1, ep. 9) — Trucking was popular on the screen in the 70s. So of course, TV shows would follow trends, right? And Incredible Hulk was a Universal show. And you know what ELSE was from Universal? A TV movie about a killer truck directed by young director Steven Spielberg called DUEL! Why not take footage of truck action and reuse it in the TV show? Brilliant! or it would be if the episode was any good. I love 70s trucking movies. Even bad ones. Hulk vs. a truck SHOULD be great. The Phenom (season 5, ep. 1) — None of season five is very good. This is the worst of it. The worst of the series, perhaps. Baseball politics! If you want to see Hulk take on baseball players who attack him with fast pitches while he happens to be holding a bat so he can knock a baseball out of the park. go for it. Unfortunately, that sentence is better than the scene. 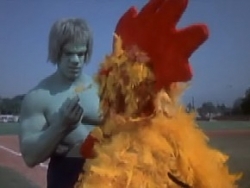 Oh, and Hulk has a slapstick encounter with the mascot…if by “slapstick” you mean utterly lifeless and unfunny. The Antowuk Horror (season 2, ep. 2) — Not a great episode, but one that really sticks in my mind from when I was a kid. Partly because Colonel Decker from The A-Team is in it, and partly because of the mystery of what the monster might be! Is it a match for the Hulk? Because NOTHING was a match for the Hulk in almost every episode! And when you find out what the monster IS, the stakes get even higher and a child is involved and I was a child and…anyway, I really liked this episode as a kid, but I'd never put it on a list of best episodes. King of the Beach (season 4, ep. 9) — Lou Ferrigno plays a man who is a body builder and deaf, in a story that shares some similarities to Ferriggno's real life. More importantly? Ferrigno appears outside of his make up! Ferrigno comes face to face with his green alter ego! A big fan of ‘The Incredible Hulk. I agree that ‘The Phenom’ is the WORST episode of the series. Bad script and even worse acting. Another fifth season episode, ‘Slaves’, was also an embarrassment.